Mountainboarding is an awesome outdoor sport and very easy to get started with. There are loads of riding locations all over the UK from specific mountainboard centres to public hills and woodlands. 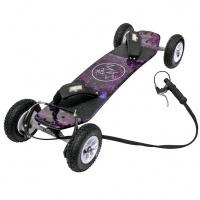 We stock a range of dirt boards suitable for beginners, intermediate and advanced riders who demand the most from their equipment. 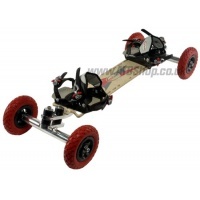 We carry spares and accessories for all of our boards so you will never have issues repairing your mountainboard. We supply boards from all major makes. If you want a kite landboard or a downhill board we should have the right board for you! The HQ Raid ATB Assassin is one of the most popular beginner to intermediate kite and mountain boards we sell. 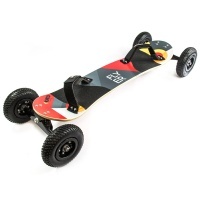 A great board for the money to get you rolling and on your way. The HQ Raid ATB Thief 8in is the lighter version of the Thief a good board for adults or older juniors wanting to go downhills fast. Still long and low it offers great speed stability but lighter weight. 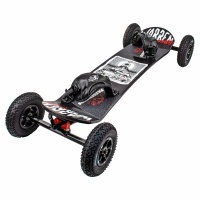 The HQ Raid ATB Thief 9in is a a good board for larger adults wanting to go down hills, & fast. This board is quite low and stiff and therefore not suitable for young riders. 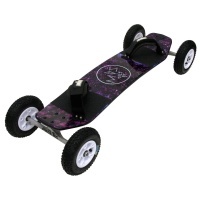 The MBS Colt 90 Constellation mountain board has seen some amazing upgrades this year and is ideal for juniors or adults who want a good board for learning kite and downhill riding. 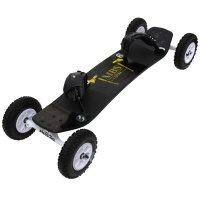 The MBS Colt 90X is a great beginner board for adult or junior riders who want a brake included. Based off the Colt90 but with a brake fitted ready to ride. The MBS Comp 95 was the board everything else compared to. Now a total new birds redesign to the Comp 95 brings in a new benchmark board. Great for beginners and more advanced riders alike. MBS's freeride tank, the Comp 95X is the standard comp 95 with after a trip to the gym to build it's freeride muscles! Running on 9 inch tyres and pre-fitted with a brake. The MBS Core 94 Axe mountainboard or kiteboard is so much more than it's previous Core boards. Now with 12mm skate trucks and F5 bindings and composite deck it's ready for everything. The top level pro mountainboard for most riders, the MBS Pro 97 DW2 Dylan Warren has been designed from freestyle street riding and is stiff and responsive to give the maximum performance. The classic noSno board the freestyle freeride is designed for everything. Soft and flexible deck and tough as nails build quality to chew up rocks and spit them out. The noSno Pro Downhill is the top level board with Hydraulic disc brakes fitted. This is the rolls royce of mountainboards and what is used all over the world in the big mountains! Everything on the top pro downhill board but without the brake that's the noSno Pro Freeride. Composite axles, deck and everything top of the line. Built to chew the mountain up. Taking the classic freestyle freeride but adding a stiffer pro deck this is the board of choice for many noSno riders in competition and freeride. The Trampa race and freeride boards for more advanced riders. Trampa downhill 35 deg long is perfect for adult riders wanting to ride everything. The Trampa 35 Short Freeride is ideal for smaller riders or kite boarders wanting a channel truck board for speed but don't need the longer heavier decks. The Trampa Downhill Holy Pro Black and Red Mountain Board is great intermediate to advanced mountainboard with Vertigo Trucks, Hypa Hubs, Alpha Tyres and Ratchet bindings. The Trampa Holey Pro is a an extremely tough & good looking kiteboard for riders wanting great performance for freestyle & freeride riding. Comes in multiple deck plys. The Holy Pro 35 Downhill Complete is the top end of Trampa's range with Ultimate Ti Trucks, Superstar wheels and Ratchet Bindings this is the top end race board with attitude. Looking for a great intermediate kiteboard which has all the spec but not the glam then this is the one! The Trampa 15 Freeride has all the top trampa features but in plain black. The Kheo Flyer V2 is a great slightly shorter channel truck board ideal for kite flyers or shorter downhill riders wanting super stable board for speed runs or prefer channel trucks.